Tickets: $24 general admission ($20 for students and seniors). Purchase tickets at the box office or on the Actors' Theatre website. “The American Dream is not for everyone,” chanted cast members at the Wednesday night dry run of Lines: The Lived Experience of Race. “This is not a country that people can pull themselves up by their bootstraps,” the cast continued. Over the past two years, Stephanie Sandberg and Company conducted 162 interviews focused on racism with Grand Rapids community members like Mayor George Heartwell, activist Jeff Smith known for his work with the Grand Rapids Institute for Information Democracy, entrepreneur Tami VandenBerg who co-owns The Meanwhile, and Dr. Randal Jelks, a former history professor at Calvin College. Their goal was to come up with a model for the type of community they wanted to create and to get to the root of the lines of racism drawn in Grand Rapids. Cast member, Michael Travis, whose family has suffered racism in silence, felt that the entire process of interviewing and acting out others’ words has been cathartic. 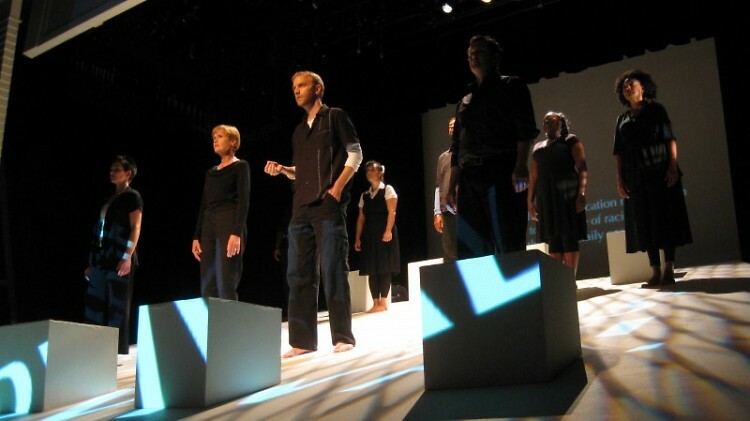 The multi-racial cast consists of director & devising team leader, Stephanie Sandberg; ensemble members, Rena Dam, David Ellens, Edye Evans Hyde, Julianne Howe-Bowens, Jean Reed-Bahle, Lewis Richards, Calin Skidmore, Lorna Torres, Michael Travis; and original percussion composer, Hugo Claudin. As the lights dimmed, the slanted stage glowed with projections of criss-crossed lines, city boundaries, and quotations. The backdrop flashed astounding statistics like: "Grand Rapids ranks 44 out of 331 metro areas for racial segregation." She noticed that residents of the neighborhoods surrounding Wealthy Street rarely patronize the new businesses, much less work at or own them. “People want diversity, but they’re not willing to do the work,” said a frustrated interviewee about the lack of cultural competency in the Grand Rapids Public Schools. 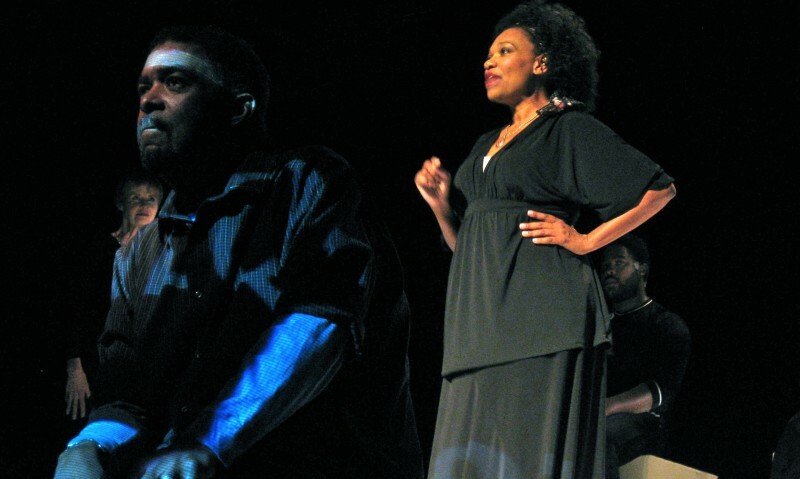 Audience members leave feeling personally convicted, but are given the tools to participate in the reconciliation and reparation of racism in Grand Rapids. “You gotta keep movin’ on,” chanted the cast members at the end of the performance. The most important thing, they said, was to let anti-racism become a passion. Audience members left the theatre inspired to be intentional about forming relationships, working on cultural sensitivity, listening to others, and acting against racism. 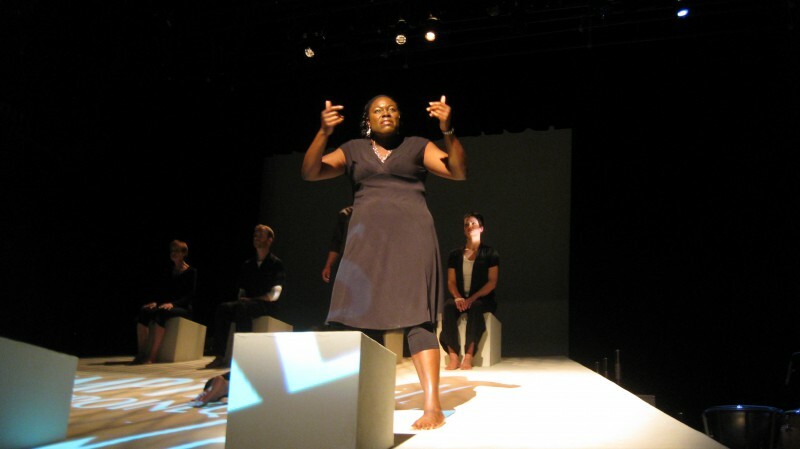 Lines: the lived experience of Race makes its world premiere at Spectrum Theatre (160 Fountain St. NE) on Thursday, Sept. 30 and will run until Oct. 9. Tickets are on sale at the box office or online. A few months ago I went to a "table reading" of Lines at the GRAM, as it was in-progress. It was incredibly moving, even in its rawest form. I highly recommend going to see it if you have the opportunity. I'm definitely going to see this. i am very much looking forward to seeing this. "She noticed that residents of the neighborhoods surrounding Wealthy Street rarely patronize the new businesses, much less work at or own them". The gentrification of Wealthy and Cherry Streets is something that has been on my mind for a while. As a resident of that neighborhood (Cherry/Eastern FTW) and an employee of the Meanwhile Bar, I like that there are now things to do in the area, and walking down the street does make me feel like I'm in a northside Chicago neighborhood. However the issues of race and class division are more evident than ever. I deeply regret that I won't be able to attend the remaining dates for Lines due to prior obligations each of the days. However I hope it creates further dialogue and that residents can have something to say other than "Its good that Wealthy Street is nice again". The issue is so much more complex than that.